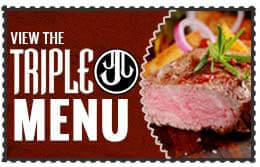 There are still quite a few of you out there that think that Triple J is just a steakhouse. As the area’s premier steakhouse, we think we make the best steak in Panama City Beach. That said, we offer a lot more than just great grilled beef! For over ten years we have been providing families and diners from around the country with a full array of delicious selections ranging from fresh Florida seafood, to grilled pork and chicken, and the ever popular mile high burgers & sandwiches. In addition to the expansive Dinner Menu, we offer lunch daily and a weekend Brunch. 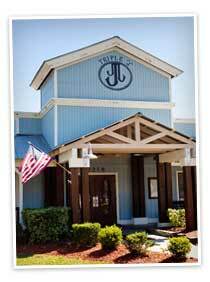 The home-style Lunch Menu at Triple J is extremely popular and has been a favorite with the local business community for years and the Weekend Brunch at Triple J is truly a treat offering more than your typical “benedicts” and kicking your weekend off right with hand-crafted libations. We are also one of the only restaurants on the beach to offer live entertainment almost every night of the week year-round. One reason why the locals love us! …and you thought we only did steaks. Triple J is a unique and relaxing place to visit. It is our primary goal uphold this standard of uniqueness while offering the finest, freshest food and paired with the attentive superior service that you deserve. A distinctive element we pride ourselves on is serving fresh cut salads as well as homemade dressings and sauces daily because the quality of our hand-crafted recipes represent our name. So please… be comfortable, enjoy yourself and indulge in great food… the way it was meant to be. We have a simple basic philosophy. If you want to serve a great meal you have to start with the best ingredients available and treat them with care all the way to the plate. It’s why we take great pride on only choosing the freshest vegetables from the farm for all of our famous salads and delicious sides. It’s why we spend so much time with local and regional fisherman reviewing their recent catches for the beautiful Florida seafood found in so many dishes on our menu. That’s also why all of our steaks are 100% Certified Angus Beef – considered to be among the finest beef in the world – and are aged to the peak of tenderness and flavor. 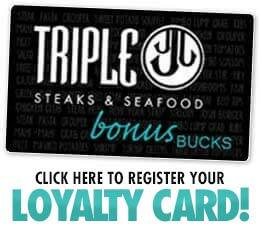 Match all of that with a true commitment to service in a comfortable and relaxing atmosphere and you’ll understand why so many tourists and locals alike call Triple J their favorite restaurant on the beach. Open year round for Lunch, Dinner and Weekend Brunch. Locally owned. Family operated. Phone: 850.233.9514 | Email Us!